Salesforce is a great CRM that allows businesses to easily put customers at the center of their attention. But even a tool like Salesforce can be halted by poor quality customer data. 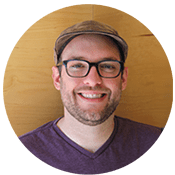 Well, luckily for businesses and their data, Salesforce allows its users to call outside APIs and web services like our data validation services. If this is something that you haven’t done before, it can be a bit tricky; but don’t worry! The integration specialists here at Service Objects have you covered and we can show you how to get up and running in Salesforce in no time! One of the first things you will want to do to get your data validated is to add the Service Objects domain as an allowed site to access from within Salesforce. To do this, log into your Salesforce account and enter “Remote” in the Quick Find search bar as shown below. Select “Remote Site Settings” and you will be taken to a page that lists all of the external sites that you can access from within Salesforce. 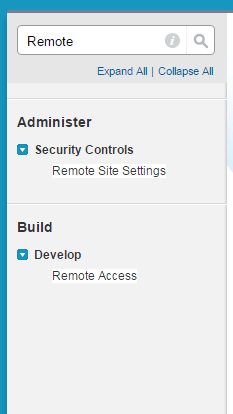 Select “New Remote Site” and enter the information as shown below. Once you click “Save” you will be ready to validate your data through a Service Objects web service. You should also add the site wsbackup.serviceobjects.com to the list of remote site settings as this will allow the ability to integrate proper failover configuration into your application. If you are using REST to access a Service Objects web service, then you are good to start validating data. You simply have to make the HTTP call to one of our web services and then decide how you want to implement your newly validated data. If you happen to be using SOAP to connect to our services, then you will have to alter the WSDL you use to connect to our services. A WSDL is a machine-readable document that tells a platform and coding language how to connect and interact with a web service. In order to do this, a bit of the WSDL will need to be altered. Lucky for you, we have already done this! We have a flight of updated WSDLs, Apex code examples, and handy guides for each of our services that will help you get up and running in Salesforce in no time. To upload the edited WSDL, select the “Develop” link under the “Build” heading on the left-hand side of the main screen. 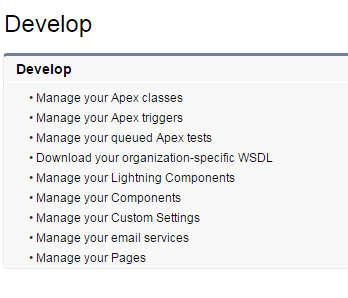 Then select “Manage Apex Classes”. 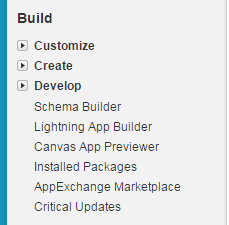 On this screen, you can select the “Generate from WSDL” button and then choose the updated WSDL to upload to Salesforce. If the WSDL has been properly edited then all the necessary classes will be successfully created and you can begin accessing Service Objects web services through Salesforce. Your data is now ready to be validated! Once you have ensured the integrity of your customer data, you can get back to using Salesforce to guarantee the best interactions possible with your customers! Also, be sure to check out our Free Salesforce Chrome Extension for a quick and easy validation tool to use in your browser!